After being forced to marry at 14, Razia from Bangladesh, was denied an education and was forced to stay at home and provide for her husband and children. After being trained by The Hunger Project, Razia was empowered with the knowledge of how to change her situation. 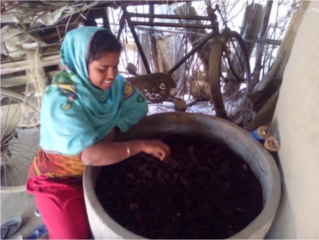 She started a women’s self-help group in her community, set up her own compost plant to produce organic fertilizer for her home garden and encouraged 20 other women in her village to set up their own organic compost plants too. She also learnt how to raise poultry and livestock and now has enough savings to easily support the health and education of her children. Razia is now an advocate for the education of all children in her community! What an inspiration!